Boaters on Lake Murray may notice numbers of dead or dying striped bass in the water over the next few weeks. This is a result of what S.C. Department of Natural Resources (SCDNR) biologists suspect is a combination of high organic inflow, dissolved oxygen depletion and stratified water temperatures. Oxygen depletion is likely related to nutrient loading associated with high October and January inflows carrying both point and non-point sources. As of Aug. 22, 804 striped bass (the majority ranging from 18 to 22 inches in length), have been counted from the fore bay area of the dam to just past Spence Island. SCDNR biologists are monitoring the reoccurring striped bass die-off at Lake Murray. "This striped bass die-off is associated with a water quality phenomenon that occurs in a number of reservoirs in the Southeast where striped bass are stocked," SCDNR Fisheries Biologist Ron Ahle stated. "At Lake Murray, this type of fish kill generally occurs during the latter part of the summer and may vary in magnitude from year to year." Similar summer die-offs have occurred at Lake Murray since 1973, with the last one occurring in 2010. A condition referred to as a temperature-oxygen squeeze is usually to blame. Each summer, Lake Murray becomes stratified into several water layers including the (1) epilimnion, the upper layer with warm water and highest dissolved oxygen, the (2) metalimnion, the middle layer associated with the thermocline with little or no dissolved oxygen, and the (3) hypolimnion, the deeper levels of cooler water that contain low concentrations of dissolved oxygen. During the early summer months, striped bass concentrate at depths containing the best balance between cool temperatures and suitable oxygen levels. As summer progresses, the upper layer becomes too warm for stripers, which generally prefer water less than 78 degrees, and the fish become confined to deeper and cooler waters. As the oxygen levels in the hypolimnion are depleted, suitable habitat for striped bass is reduced and the fish become stressed. When conditions persist, many of the stressed fish eventually die. "The duration of the current Lake Murray fish kill will depend largely on weather conditions and the period of time it takes for the lake to begin to de-stratify." Ahle said. "We will continue to monitor the situation over the next several weeks." 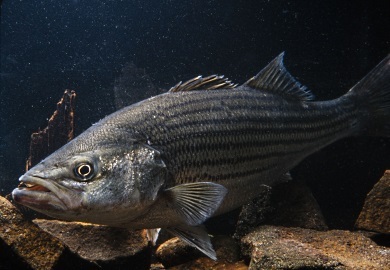 The temperature-oxygen squeeze that is impacting the striped bass does not render live fish unsafe to eat and, therefore, SCDNR is encouraging anglers to keep fishing. Those taking part in striper fishing should abide by the special summer regulations. The Lake Murray law states: (E) On Lake Murray and the middle reach of the Saluda River it is unlawful to possess more than five striped bass a day. From June first through September thirtieth, it is unlawful to take, attempt to take, or possess more than five striped bass a day.